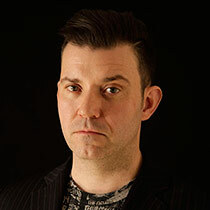 Lee is a Senior Lecturer in Printmaking and Illustration on the BA (Hons) Illustration and Visual Media course. Leigh graduated with an MA in Printmaking from the Royal College of Art in 1998. His political projects are manifested through radio, recordings, film, performance, printmaking, painting, sculpture, publications, curating, writing and exhibitions. Lee has exhibited internationally including solo exhibitions and residencies in London, The Netherlands, Antwerp and Norway. In 2012 his work entitled 'Heads of State' was selected for the London Open 2012 at the Whitechapel Gallery. He has collaborated and curated projects at Lokaal 01 in Antwerp, Extrapool in Nijmegen and is currently Printmaking Tutor at the Royal Academy Schools, Royal Academy of Arts London. He has taught widely across on Foundation, Undergraduate and Postgraduate courses within UAL and nationwide.